Political guru James Carville famously wrote “It’s the economy, stupid” on the wall at Clinton headquarters during the 1992 presidential campaign. The logic is simple: when people have jobs that pay enough to cover the bills and provide for some entertainment, they are happy. If the voters aren’t happy, they will generally view the current administration as the cause of their distress, and take out their frustration on incumbents. This little nugget of political wisdom is amplified by the general lack of understanding amongst regular voters about real economics. Economic indicators generally lag; Reagan and the Republicans were hammered in the 1982 mid-terms for sky-high inflation that was the sum total of government policy and central bank strategy from the 1970’s. Although he was the V.P. during the Reagan years and bore some culpability, George H.W. Bush was punished in 1992 for a recession spurred on largely by Reaganomics and a fairly normal inventory cycle downturn. In all likelihood, President Obama and the Democrats will be punished for an economy defined by failed policies from the Bush Administration, Clinton Administration, and the Greenspan/Bernanke Fed. An economy runs on money…no surprise there, but the money in an economy is very much like the blood supply in your body. When you don’t have enough, systems start to fail, with the only real treatment being a transfusion. When people lose their jobs, they stop spending. When people stop spending, businesses trim their labor force, meaning more people losing their jobs, leading to less spending…leading to more job loss. 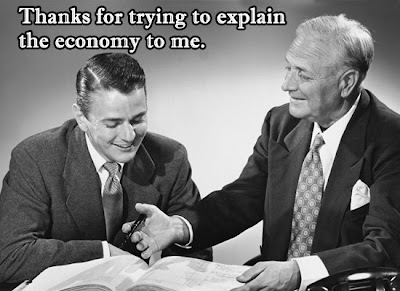 It is a simple enough process to understand, and the basis of the philosophy of Keynesian economics. When major recessions take hold, government becomes the spender of last resort. This is a tried and true method; Roosevelt used it to bring the nation out of the great Depression (a full two years before the United States’ active involvement in WWII); Reagan used it to spend the nation out of the stagflation that took hold in the seventies. It is indeed instructive to realize that the seventies, not noted for economic progress, represent the low point in government debt as a percentage of GDP since WWII. All of this history informs our current debate. The Obama Administration and the Democrats tried to play the same card as Reagan and Roosevelt, but were largely thwarted by public opinion. We the people have been sold on the traditional conservative notion that tax cuts drive economic growth; and they can, but only in very specific cases. Reagan’s early tax cuts drove wealth into the stock market, paving the way for the market boom of the 1990’s. He had the opportunity to make very large cuts to exorbitant top-marginal rates. Cuts of that magnitude are no longer available. But the phenomena of diminishing returns seems to be lost on conservatives when it comes to tax cuts. As an example, President Obama included in the stimulus package one of the largest middle-class tax cuts in history; did you notice it? I have made the challenge many times before on this space, and it has yet to be met. How do tax cuts help individuals without jobs, and businesses without customers? If you don’t have income, an income tax cut does nothing for you. The other side of the stimulus is also the other side of this column; government spending and debt. Government spending, and specifically debt spending, is the blood transfusion that a weak national economy needs. Through the sale of treasuries and the monetizing of dent (i.e. printing money), the Fed pumps money into the system; money that goes to contractors, government employees, schools, hospitals; literally any organization that can receive a grant. This money is then spent in the private marketplace; on mortgages, groceries, appliances, and cars. But what is the downside? From where does the risk of this deficit spending come? Isn’t it unsustainable? Won’t it bankrupt our nation? Shouldn’t we be taking the same austerity measures as Greece and Portugal before it is too late? No, no, no! Heck no! The risk, for the United States at least, is limited to the manageable threat of hyperinflation. Bankruptcy is not a risk; our debt is denominated in money that we print. The worldwide investment community is still very happy with the United States as a credit risk, as evidenced by the relatively low rates investors are accepting for 20 year notes. If we were in truly desperate straights, we would see an inflation of those rates first. To be certain, hyperinflation is nothing to laugh at. It has destroyed economies and started wars. But there is a certain amount of irony associated with conservatives fearful of a “new world order” taking to heart economic advice from the I.M.F. Asian nations learned a hard lesson about the negative effects and questionable outcomes of I.M.F. imposed austerity measures. When it came time for Argentina to deal with their financial woes, they eschewed the measures recommended by the I.M.F. The recovery of the Argentinian economy, prior to the current world crisis, is both well-documented and instructive. Excluding home prices (pre-crash), medical costs, and fuel, the United States has experienced near-deflationary rates for some time now. Deflation is not a good thing, and it is evident that there is room for growth in the rate before any threat to economic health. It is the great irony of our time that people protest the lack of jobs while simultaneously demanding a reduction of government spending. The fact is only slightly less of a contradiction than demanding deficit reduction and tax cuts simultaneously. The private firm Moody’s is clear in its confirmation of C.B.O. findings, that the stimulus package kept the unemployment rate from hitting 12.5%-13%. As the economy starts its long recovery, the steady increases in federal tax receipts and decreases in unemployment payouts (both as a result of people going back to work), will serve to shrink the annual deficits and change the long-term debt projection. The recession is the culprit in fully half of our current annual deficit, with some number near $700 billion in reduced tax revenue and increased unemployment payouts as its direct result. It is precisely those times when the economy is roaring that the U.S. government should seek to cut back on spending. Heavy deficit spending, followed by a sensible and steady increase in the prime interest rate, is the best prescription for getting out of a recession. The continued comparison of household finances to that of the government’s is both flawed and dangerous, and has led to the precipitous lack of spending in infrastructure projects, from roads and bridges to education, that is the real threat to the U.S. economy. Governments don’t inspire innovation, but the market can’t efficiently build the roads or teach the children. The latter ideas are just as essential to U.S. power as the former, and need to be seriously looked at by the voters. As this election season picks up steam, we need to understand the balance between government and market, debt and inflation. To ere on the side of austerity is to shrink from the challenges of our future. This debate isn’t about China, debt, or tax and spend politics; it is about jobs and, as Carville said, “…the economy, friend“. Do You Know Why You’re A Liberal?